The American Crocodile is the one that most people are familiar with. This is the type of crocodile that is usually portrayed in pictures for books and advertising. The full grown males can grow to be about 15 feet long and the females about 10 feet in length. They can weigh from 380 to 2,000 pound when they are fully grown. They feature an olive green color that people find to be very pretty. 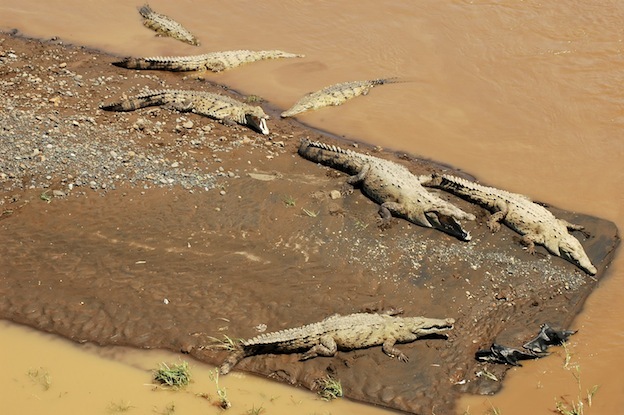 As a result, they are the type of crocodile often used to make bags and belts. They have a long tapered body with a powerful tail. Central America is where you will find the American Crocodile living. However, their population extends over a vast area. They are found in Cuba, Florida, and Jamaica to name locations where they have very large populations. They can’t be in water that is less than 45 degrees Fahrenheit. If this occurs their body will slow down too much and they will die. They are able to live in both fresh water and saltwater. Due to the fact that they have their eyes, nose, and ears at the top of the head they can place the rest of the body under the water. This makes these crocodiles very dangerous as you may not even know they are around until it is too late. They use this same element of surprise to attack their prey in the water. They are very fast swimmers, at a rate of about 20 miles per hour. The diet for the American Crocodile consists of a variety of fish, reptiles, birds, and mammals. They will take the opportunity to eat what they can from the smallest of animals to the largest. They have no problem taking down large prey. With their powerful jaws they are able to take them down and then hold them under water until they drown. They can go for many days without a meal but they are going to take a chance to feed when it is there. The American Crocodile mates in January and February. The male and the female will go their separate ways soon after. The female then starts her work on a nest for the eggs to be deposited in. She will create it on the shore and this is what she will spend most of her time doing. She will deposit from 35 to 60 eggs into the nest. They will remain there for a period of 2 or 3 months. The warmer the temperatures are the sooner they will emerge. She will help the young from their eggs to the water. Once they are in the water though she will abandon them. While other species of crocodiles will offer can for some time this one doesn’t. As a result only about 2% of them will survive to make it to adulthood. They can begin mating themselves when they are about 8 years old or when they have 9 feet long. 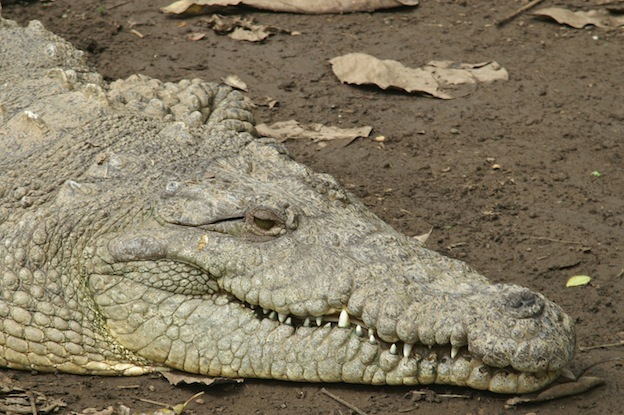 The American Crocodile has been reduced by drastic numbers in the past couple of decades. This is due to it being hunted for the hides. It is also due to humans taking over their habitat. In many areas of water the pollution has been a contributing factor as well. Efforts have been in place to offer them protection since 1996. Such efforts have been successful too which is really good news. As of 2007 the status of the American Crocodile was reduced from endangered species to threatened species and today is vulnerable. However, efforts need to continue to stop poaching and to help protect their environment so that they can get back up to a good number.